Haas Group International is a leader in chemical management throughout the world. Haas Group International is growing. Haas has the resources to oversee operations in 22 countries, with 200 facilities around the globe, offering services in Chemical Management, Product Distribution, Supply Chain Management, and Hazardous Communication Services. Even though Haas Group International fulfills the needs of customers in eight different industries, including aerospace defense, airlines, automotive, electronics, energy, food and beverage, government, and manufacturing, Haas Group International needed assistance when it came to branding and website design and development. 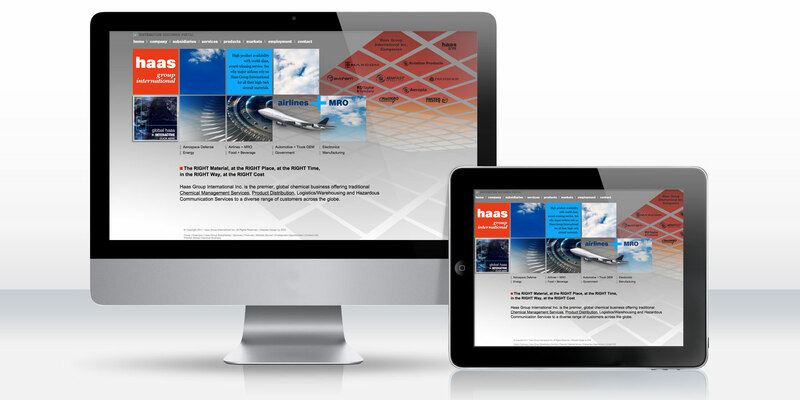 As a leader in our field, DDA took on the challenge of developing a website that showcases all that Haas has to offer. DDA suggested and discussed new marketing themes with Haas Group International that encompassed all the markets, products, services, and subsidiaries under the Haas name. As an international company, the themes had to be universal and the end result had to cross borders both internationally and interactively. A state-of-the-art website design that includes a rotating industry presentation, an interactive market presentation, and a section featuring each Haas subsidiary. The rotating presentation on the home page flips through images that represent each industry and briefly describes the impact of Haas Group International. The home page also contains a link to an interactive presentation that takes users on a trip around the world to visit each Haas subsidiary and the international market it serves. DDA graphic designers also followed the box design to create a section on the home page that highlights each subsidiary of Haas Group International. This section links to each individual subsidiary webpage, which DDA copywriters assisted in writing. Now Haas is not only paving the way in the field of chemical distribution and management, but with a new highly interactive, all-encompassing website, Haas Group International is setting standards for industrial websites as well.